When I first came to the U.S., go home, my sister lived in California for some time. Is in California this time, seen all the famous avocado corn salad. First time to eat it, I felt so hard and ate the meat whistling, not what flavor, eat two small pieces no longer eat out. Later, a long period of time, all of this stuff at arm’s length. Until a few times to eat in the restaurants and shops in a California avocado rolled sushi, as well as authentic made with avocado small point, which tasted not bad, so that two to go, actually fell in love with was very annoying avocado, when grocery shopping every week, have to buy a few.Unfortunately, her husband still can not accept the taste of avocado, (heart secretly despise about this stubborn guy, O (∩ _ ∩) O ~), avocado bought me all likelihood have been wiped out by a person . 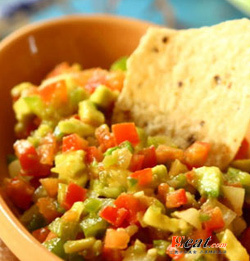 Ingredients: 1 avocado, 2 sweet corn, 1 tomato, cut into Ding, 1 / 2 onion, cut into Ding, 1 clove garlic, crushed garlic, 1 / 2 lemon, squeezed out lemon juice, 2 tablespoons olive oil, 1 small handful parsley, chopped, 1 handful of freshly ground black pepper at the end, Salt to taste. Firstly,very simple matter, will be taken out avocado flesh, cut into Ding, pour a teaspoon of lemon juice, mix a mix, so that the flesh can not be oxidized avocado color. And then, steamed corn, cut corn kernels, and then mixed together with all the materials now! Avocado Corn Salad is finished.